Access physical activity grades, report cards and other related documents from all Global Matrix events in which Belgium (Flanders) has participated. To increase overall physical activity levels among Flemish children and youth, coordination and cooperation across policy domains (e.g., Education, Sport, Youth, Public Health, Mobility) and settings (e.g., School, Sport Clubs, Community Sport) is needed to make full use of the policies and programs currently in place. To decrease the high levels of sedentary behaviour in Flemish children and youth, existing evidence-based strategies should be implemented at schools and in the home environment. A structural systematic nationwide objective monitoring of physical fitness is needed. Jan Seghers, Ph.D.Jan Seghers received his PhD in Kinesiology in 2003 from the KU Leuven (Belgium) and currently holds the position of Associate Professor at the Physical Activity, Sports & Health Research Group within the Department of Kinesiology at the KU Leuven. The Physical Activity, Sports & Health Research Group has established an international reputation in the area of health-related physical activity promotion. This research group brings together a multidisciplinary research team (physical activity epidemiology, sports psychology, sports pedagogy, sports coaching) contributing to the optimization of health, well-being and quality of life in society through physical activity. 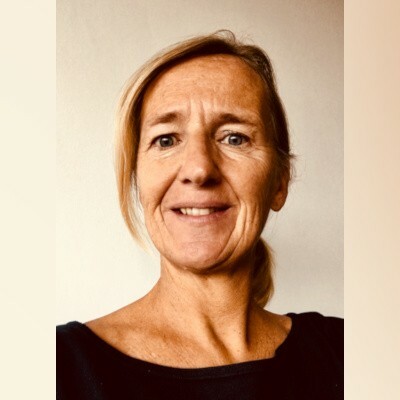 Jan Seghers is occupied with a research, educational, and consultancy task within the scientific fields of sport & exercise pedagogy, physical activity epidemiology and physical activity promotion. 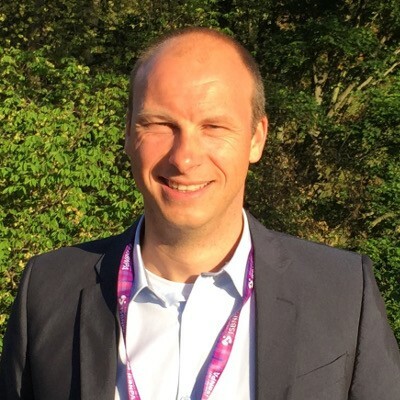 He is head of the Master’s programme in Physical Activity, Physical Fitness and Health within the KU Leuven Master’s programme in Kinesiology. His research focuses on the study of determinants of physical activity and sedentary behaviour across the life span, as well as on the development and evaluation of interventions to promote physical activity and reduce sedentary behaviour in different age groups and settings ((e.g., school-aged children in school setting, adults in workplace setting). Since 2012, he (co-)authored more than 20 international peer-reviewed scientific papers and several book chapters related to physical activity, sports and health. He has research collaborations with Universities in Europe and abroad and is actively involved in the HEPA-Europe Network. Full bibliography: lirias.kuleuven.be/cv?u=U0032649. "Participating in the AHKGA Global Alliance 3.0 initiative encouraged researchers, policy makers and practitioners to collaborate more and to further bridge the gap between science, policy and practice." - Jan Seghers, Ph.D. Despite the many health benefits associated with physical activity (PA) throughout childhood, the majority of school-aged youth in Flanders, the northern Dutch-speaking part of Belgium, do not meet the guideline of 60 minutes of moderate-to-vigorous PA (MVPA) per day. The purpose of this abstract is to summarize the results of the 2018 Flemish Report Card. The 2018 Report Card included the 10 core indicators that are common to the Global Matrix 3.0 (Overall Physical Activity, Organized Sport and Physical Activity, Active Play, Active Transportation, Sedentary Behavior, Family and Peers, School, Community and Environment, Government, and Physical Fitness). The Belgian Food Consumption Survey 2014-2015 conducted by Sciensano was selected as primary data source given its assessment of a wide range of health behaviors and objectively measured PA data in a representative sample of Flemish children and youth. Despite the good availability of facilities, policies and programs at the municipal/community and school levels, over 90 percent of Flemish children and youth are not meeting the current MVPA guideline (Table 1). Nonetheless, moderately positive scores were observed for specific PA behaviors such as organized sport participation and active transportation. 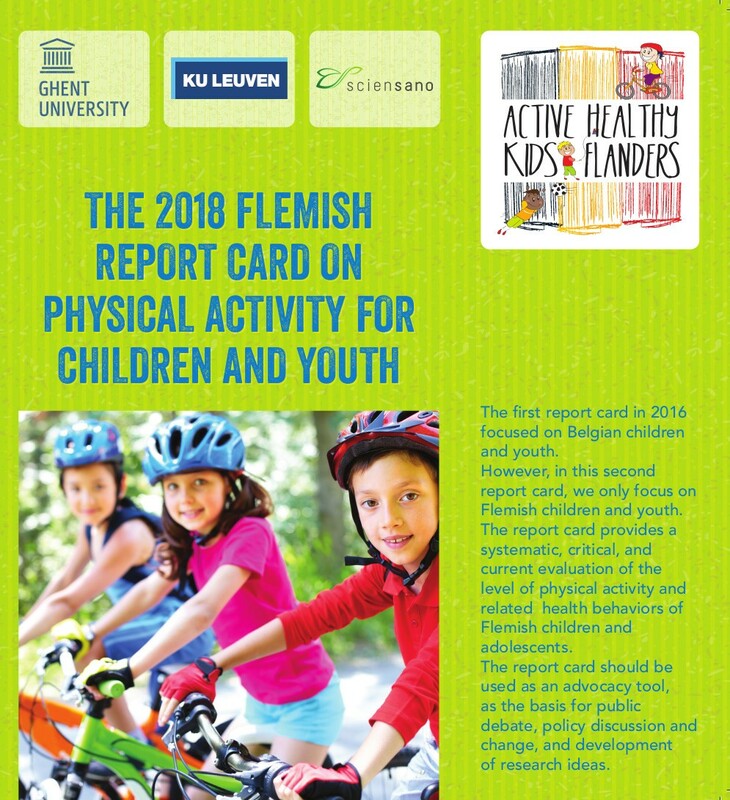 The 2018 Flemish Report Card on Physical Activity for Children and Youth shows that levels of overall physical activity are very low and levels of sedentary behaviors are high, despite moderately positive influences from the social, political, and built environment. This may signal the need for a ‘Health in All Policies’ approach and a more coherent approach to PA promotion efforts at all levels of policy-making. To make full use of schools’ potential to promote physical activity, we need to take a whole-of-school approach that is comprehensive, coordinated, and provides opportunities for children and youth to be active before, during, and after school. This should include offering quality physical education, providing activity-friendly school playgrounds, promotion of active transport and organization of sports activities at lunch, recess, and after school in partnership with the wider community. To promote active travel, outdoor play and other unstructured physical activities, the creation of safe and attractive physical environments is key and needs to be done in collaboration with urban planners and other relevant stakeholders. To lower gender and social inequalities in organized sports participation and also reach the less sports talented, sports clubs should be encouraged and supported to be more inclusive. Schools should be encouraged to provide regular movement breaks and to implement environmental changes to decrease and interrupt prolonged sitting time during school hours. Structural systematic nationwide (objective) monitoring of physical activity, sedentary behavior and related health behaviors is needed to inform policy and practice. "Participating in the Active Healthy Kids Global Alliance facilitated a nationwide discussion and collaboration between experts from research, education, policy, and practice in the field of physical activity, sport, sedentary behavior, and dietary behavior." - Jan Seghers, Ph.D.
Wijtzes AI, Verloigne M, Mouton A, Cloes M, De Ridder KAA, Cardon G, Seghers J. 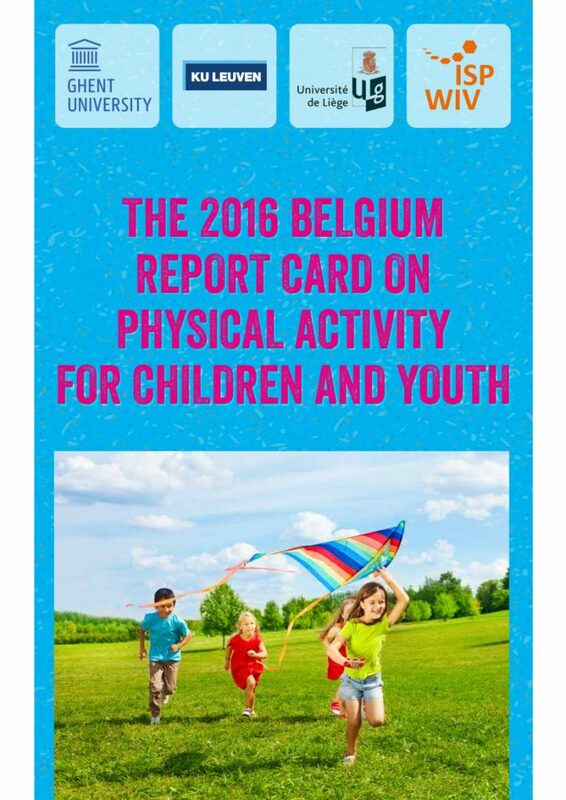 Background: This 2016 Belgium Report Card on Physical Activity for Children and Youth is the first systematic evaluation of physical activity behaviors, related health behaviors, health outcomes, and influences thereon, using the Active Healthy Kids Canada grading framework. Methods:A research working group consisting of physical activity experts from both Flanders and Wallonia collaborated to determine the indicators to be graded, data sources to be used, and factors to be taken into account during the grading process. Grades were finalized after consensus was reached among the research working group and two stakeholder groups consisting of academic and policy experts in the fields of physical activity, sedentary behavior, and dietary behavior. Results: Eleven indicators were selected and assigned the following grades: overall physical activity (F+), organized sport participation (C-), active play (C+), active transportation (C-), sedentary behaviors (D-), school (B-), government strategies and investment (C+), and weight status (D). Incomplete grades were assigned to family and peers, community and the built environment, and dietary behaviors due to a lack of nationally representative data. Conclusions: Despite moderately positive social and environmental influences, physical activity levels of Belgian children and youth are low while levels of sedentary behaviors are high.